"Welcome to my parlor," said the spider to the fly. Our little household had a hectic schedule today, and my two boys had to be roused from their naps to get into costume and go door to door, asking candy from strangers. Nothing like Halloween trick or treating to spur a little sugar-fueled madness. Since I am officially on vacation leave from work, I did a production number on the Halloween decoration at home. We constructed a humongous, big-bellied spider to climb over our gate. I had fun hacking old cardboard boxes and stuffing black garbage bags with newspaper to form our awesome arachnid. Kids passing by the house would ogle and touch the spider, then run away laughing. My sons enjoyed the frenzy of activity, though Jethro wouldn’t go near the spider at first. My little Superman and Mercenary Soldier had a full lot bag at the end of the day. We ran out of candies, like we did last year. Goblins and ghouls, fairy princesses, super heroes, monks, zombies, and little devils/angels descended on us like locusts! I almost got toppled over, omigod! Adults were just as rowdy. I think it was more tricks than treats this year, and the lengths people will go to for some sugar is just scary. 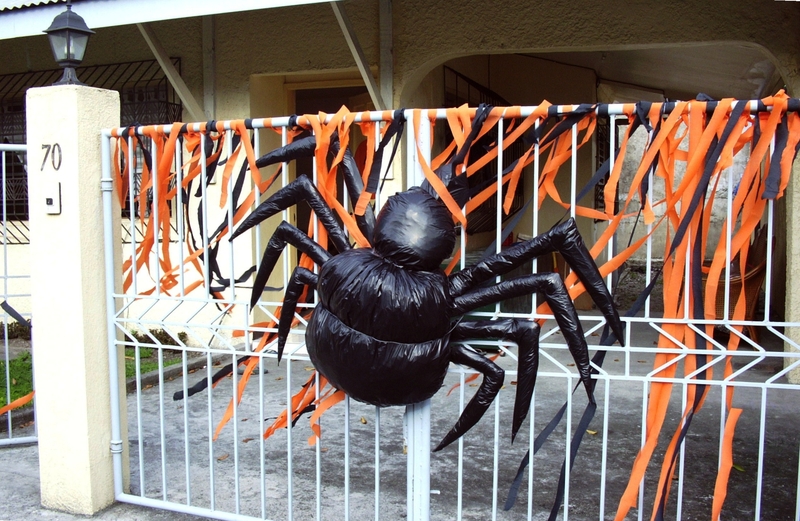 This entry was posted in The Bee and tagged costumes, halloween, halloween decorations, spider, trick or treat.